Things seemed to have grouped themselves in pairs this week. There are 2 spinning projects on the go. They’re gifts and intended as pleasing surprises (I mean, I hope the recipients will be pleased), so no pictures or descriptions today. Pictures and details will follow, though. There are 2 knitting projects on the go, but …ahem…they’re both intended as gifts as well, so, likewise, photos/descriptions will follow. There are 2 projects in the dyepots. They’re also gifts. Need I say more? Here’s what I can show you. Two bunches of lovely, lovely, lovely Corriedale roving dyed by Carol. She’s called the colourway, appropriately, “Cherries”. Carol’s got a way with colour; the photo doesn’t do it justice. Too many projects in mind. I need to clone myself. * Book is here, but you have to scroll down the page. A couple of weeks back, while planning a new spinning project, I went webhunting for Bullen’s Wullens, a business in (I think) Ohio, USA that sold fine wool tops in a bazillion solid colours. Great for blending. The website is “under construction”, I haven’t seen any ads from the company in SpinOff for a few years, and I’m wondering if they’re still in business. Does anyone know? 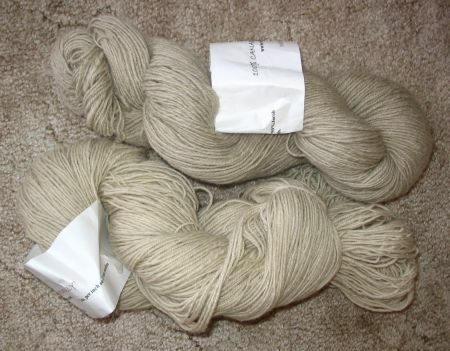 Further to that, can anyone point me to a source for fine wool top in solid (or nearly solid) colours? After reading my post on socks, a lister on Techknit –- the low-traffic, well-managed, focussed, no-chat knitting list where you can go for good technical information -- asked if I’d give more detailed directions for how I knit socks: specifically, very detailed information about shifting gusset decreases and working instep gussets. I admit to being hesitant: it’s going to be a very busy month for me, writing row-by-row instructions is slow-going for me and would likely go into several pages. To be honest, I don’t have any codified method for this; just a rather loose approach that I adapt for each sock I’m working depending on the stitch pattern I’m using. I think that at best what I’d be giving you is specific instructions for how I knit a single pair of socks to fit my foot, and I’m not sure how really useful that would be. Perhaps a set of Pithy Instructions, such as EZ used to put out in the Wool Gatherings? So here’s your chance to vote on something. If you’d like more detailed instructions on how I knit socks, leave a comment saying so. I’ll tally the interest and decide what to do. I’m off to get groceries and buy a new crockpot. Would pithy be easier for you to write? Or would it be easier to simply write out the instructions for one pair, and leave it to the reader to abstract the principles? My personal preference would be for the detailed version. Sometimes I have to work something through before I understand it. "Instep gussets" sounds like a shape I saw on a Renaissance stocking in a painting; it looked as though there was a sort of shoe-tongue shape (possibly decorative?) at the top center of the ankle/foot, besides the heel treatment. I assume that since you use them, they do something helpful for the fit. Thanks, Ted! Speaking of books: I have a couple of your books that I should probably return...bonus points if you can remember what I've borrowed. I'm looking forward to seeing how you spin up your Cherries. I say, go for the whole shebango. I can appreciate that it may take you a while, given the quality and exquisite detail that your explanations always involve, but it will be much appreciated. By many. May I vote more than once? Hmmm. I'm not sure that you need to feel any obligation here. If you want to do this and you'll enjoy it, then do it. If you don't want to do it, you needn't feel pressured to provide something to the knitternet for free. I think people have a nerve, to be honest. But then I'm famously curmudgeonly. Because I not only like reading you but I also think the word "shebango" should appear more than once in your comments, I'm with Jim. I like directions like the ones EZ has. I like to take the upperhand with my knitting-think things through for my socks. I know a lot of knitters that like evey row spelled out for them, though. I'm with M-H-you should not feel any obligation. I enjoy all that you share on your blog. You are very generous with information pertaining to knitting techniques. I think if you don't have time, you shouldn't do it. This is supposed to relax us, not make us break out in a sweat and lose sleep, isn't it? That being said, if you do it I'd go for pithy. Just because I'm clearly only 12 years old and the word "pithy" makes me giggle like a loon. Maureen has some lovely fine merino top in beautiful colours. Yes, I'd love to have the detailed information. Whatever is best for you . . .
Whatever direction you are willing to provide will be greatly appreciated and taken to heart. wow, that cherry roving is gorgeous. 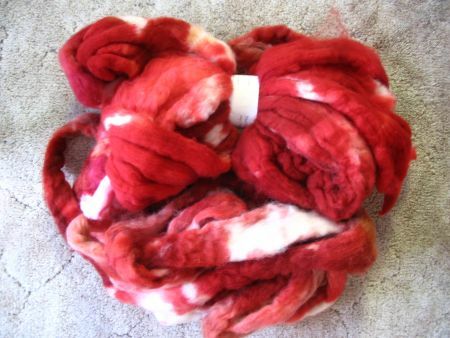 the best solid, or near-solid roving i know of is from indigo moon. it's a wool/alpaca/silk blend. she was at SPA and still had some left, but i heard she is going out of business. louet fibers also has some that we carry at our LYS, but i haven't spun it so i'm not sure of the quality . . . I'd be interested in pithy. Ashford does a line of solid colored Merino fibers. Some of the "large shops" might have them -- thewoolery.com carolinahomespun.com woodlandwoolworks.com mielkesfarm.com -- I'm sure there are others. 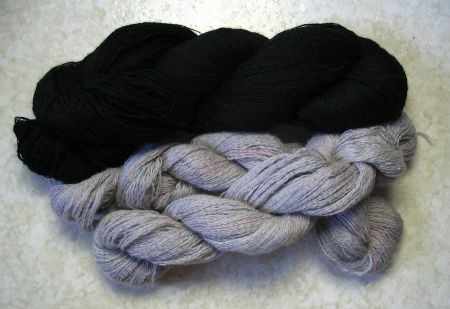 Ashford also has a line of "NZ Wool" in about 37 colors, solids, Corriedale grade fibers. Yes please on the detailed instructions. I would be interested in the detailed sock instructions, esp. if they differ from what is the norm. Regarding Bullen's Woolens, I believe that Pat stopped the business a few year ago now. I seem to remember some talk about this at SOAR three years ago. Maureen Harding at Dreamspin Fibres carries some absolutely lovely solid coloured Merino tops--really good stuff. I'd vote for more instructions on the socks--was just thinking about that today actually, honest! Pithy or not, I'll gladly soak up what you've got. Thanks!! I would like to see the in depth instructions to see what you do differently, but would prefer to wait until you have the time to write it out. I for one always have socks on needles, and can always use new patterns to use for inspiration. I would love Pithy; but, for pithy sake's don't shatter yourself over it. Thank you for asking us. Yes, yes ... detailed instructions, please. Plus a bit of pith maybe. I would really appreciate a detailed version of your sock instructions.